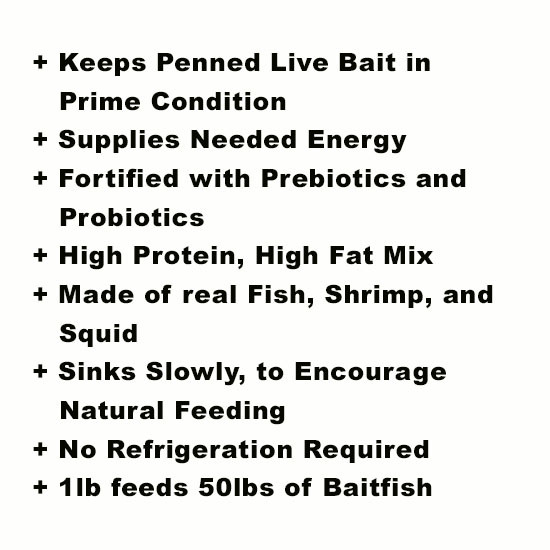 Quality live bait catches fish… a lot of fish. Anglers who have the most success are those that understand how to take care of their live bait. Whether it’s how they catch them, where they hold them and especially what they feed them, it is all very important. Some damage and stress from catching the bait is unavoidable. These fish receive damage and need to be cared for to become prime condition. Feed once or more per day by sprinkling a small amount in cage or tank. Fish will investigate food as it sinks. Some baits will require 2-3 days conditioning to eat food. 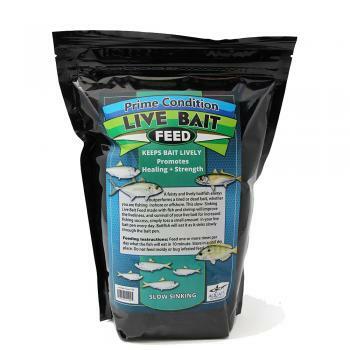 Once feeding well, feed what the baits will eat in 2-3 minutes, twice daily. One pound of food feeds 50 pounds of baitfish. Prime Condition Live Bait Feed is not for human consumption nor should it be fed to fish intended for human consumption. Store in a cool dry place. Do not feed moldy or bug infested food.